I just picked these beauties to steam, dress with hazelnut oil and a splash of lemon juice, and garnish with hazelnuts. 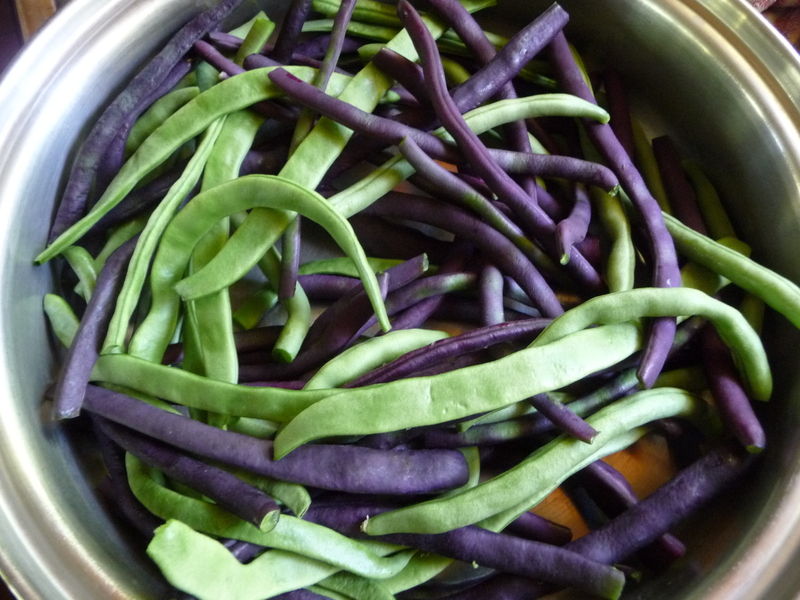 The purple ones are “Triofono violetta”, the flat green ones are “Smeralda”, and the smooth ones “S. Anna”. They’re all Italian varieties and they like our hot summers. We’ll have this bean salad with home-made pizza — tomatoes, basil, arugula, and some of the gorgeous garlic I pulled last week which is curing in the woodshed. ~ by theresakishkan on July 26, 2013. Tags: "S. Anna", "Smeralda", "Triofono violetta"
This entry was posted on July 26, 2013 at 7:02 pm and is filed under Uncategorized.You can follow any responses to this entry through the RSS 2.0 feed.You can leave a response, or trackback from your own site.